Thinking about taking a train trip this year? Riding the rails is not only a comfortable way for families to travel, but it lets you appreciate landscapes very differently than from the inside of a car. According to bookings by Vacations By Rail, the largest provider of global rail vacations, these are the most popular train destinations in the United States and Canada. Whether you begin in Chicago, Los Angeles or another place, the most popular North American train destination is the Grand Canyon, from the vast, panoramic views of the South Rim to the less-traveled, ruggedly tranquil North Rim. Across our northern border, the most popular train destination is the majestic Canadian Rockies. Itineraries exploring this region range from six to 16 days. Don't miss the famed Rocky Mountaineer scenic touring train to Banff. Arguably one of the most unique and iconic destinations in the United States, New Orleans is at the top of many rail travelers' wish lists. The list of possible departure cities includes Chicago, New York, Los Angeles, and Washington DC. In as few as six days, you can cross the US with Amtrak. Longer itineraries offer more stops, taking legendary rail routes to visit some of the country’s most popular destinations, including major cities and national parks. Equally epic is the trans Canada train journey between Toronto and Vancouver. 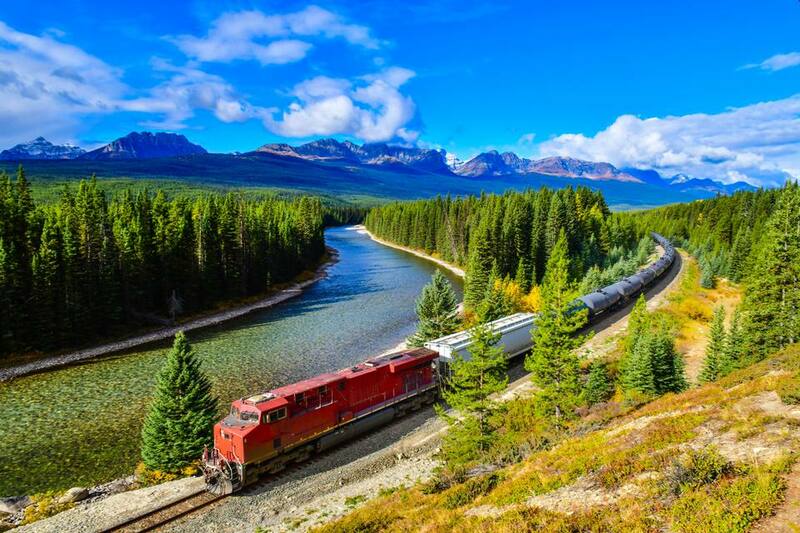 VIA Rail itineraries range from seven to 15 days, through landscapes that include tranquil lakes, dense forests, expanses of grasslands, and the majestic Canadian Rockies. VIA Rail offers itineraries that let you explore popular destinations within Ontario, Quebec, and the coastal provinces of Nova Scotia, Prince Edward Island, Newfoundland and New Brunswick. Some of the most popular itineraries combine a train trip with a river cruise or ocean cruise to Hawaii, Alaska, Mexico or the Caribbean. Perhaps not the most kid-friendly of destinations, Reno is among the top choices for rail travelers.